When should you expect an emergency? Hard to say, but chances are the correct answer to that question is when you least expect one. That is, after all, why they are called emergencies. Aside from staying calm, you also need to have a plan for when there is an emergency. In case of a dental emergency, that plan should include an immediate phone call to the office of emergency dentist Dr. Danny Nakhla at (859) 356-2000. Our front office will be able to advise you and schedule a same-day appointment if necessary. Of course, recognizing that you have a dental emergency on your hands is important, too. Read on to find out what constitutes an emergency and what you should do before seeing the dentist. The most obvious of all dental emergencies is a knocked-out, or avulsed, tooth. In this case, saving your tooth may depend on a quick response. If Dr. Nakhla can see you within 30 minutes, then he may be able to re-implant the tooth. In the meantime, hold the tooth by the crown, rinse in clear water and store is a container filled with milk or a mild salt-water solution. Another common emergency is a toothache. A severe one may indicate that you have an infected tooth. In this case, Dr. Nakhla will need to perform a root canal in order to remove the infection from inside your tooth. Seeking immediate treatment is imperative in order to avoid the spread of infection, the development of an abscess or even loss of your tooth. 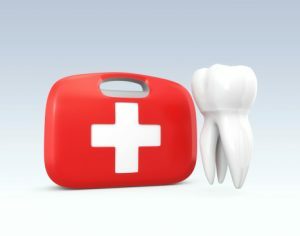 In this case, emergency care is necessary in order to avoid further loosening and possible tooth loss. Dr. Nakhla may be able to splint the tooth alongside adjacent teeth. Then, with time, the tooth can reattach in its proper position. If you see a sore that isn’t healing on your lips, gums, tongue, inside your cheek or anywhere else in your mouth, don’t wait until your next dental exam to have it checked. Call Independence Family Dentistry to schedule an appointment. This may or may not be a symptom of oral cancer, but Dr. Nakhla will want to give you a diagnosis as soon as possible. If you believe that you are experiencing a dental emergency, don’t hesitate to call Dr. Nakhla. As the emergency dentist for northern Kentucky, he will be able to assess, diagnose and treat you quickly, so you can get back to your normal routine.